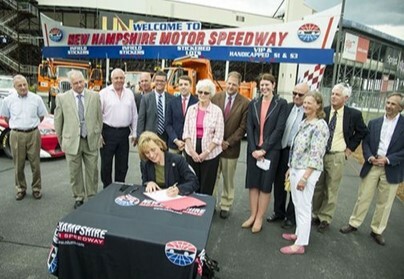 On June 23, 2016, Governor Hassan signed the Ten-Year Transportation Improvement Plan for 2017-2026 at the NH Motor Speedway, a Dupont Group client. This legislation included the first phase of widening of Route 106, critical for overall safety on Route 106 and to ease traffic in and out of New England largest sports facility, which hosts events every weekend April through October. Pictured at the far right is Curtis J. Barry, Partner, and at far left is Ed Dupont, Founder.